Visit the ruins of the synagogue where Jesus is believed to have studied and prayed. This small ancient synagogue lies beneath a Crusader church and is now maintained by the Greek Orthodox Church. It is a simple and quiet room hidden from the bustle of the market outside its doors. Be sure to include it in your tour of Nazareth. © Copyright Sheri Oz, 2012. All Rights Reserved. Jesus grew up in Nazareth. He studied and prayed in a synagogue, the ruins of which are believed to lie beneath a church built by the Crusaders in the 12th Century and that is known as The Synagogue Church. Before the Christians were freer to observe their religion in the 18th Century, the building was neglected and in ruins. The Franciscans began to renovate the site and it was completed in 1887 by the Greek Orthodox Church, that also built a new chapel next to it. The entrance to the two are through the same small courtyard. 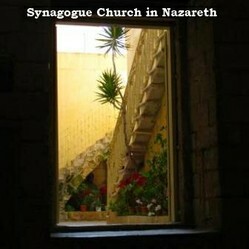 Let us proceed from the Basilica of the Annunciation to the market as the Synagogue Church can be found there. My wanderings around Nazareth on several occasions, with Christian friends and without, have led me to the market where I can enjoy bargaining for fresh fruits and vegetables and perhaps even a baklava. Given the incredibly high calorie count of this Middle-Eastern specialty sweet, I have not tasted one in years. I merely allow my eyes to feast on them now. Then, to my surprise, I noticed the sign to the Synagogue Church one day for the very first time. Had I known it was there, I certainly would have taken my friends to see it. Now, I went in alone. The first thing to strike me was the small, very aesthetic and clean entrance way; too small to be called a courtyard, really. What a contrast to the noisy and cluttered market I just left! It is made up of one single hall. Quiet and meditative. The old church is 1.5 meters below contemporary ground level. You do not have to be Christian to be moved by the quiet and meditative atmosphere inside the Synagogue Church. It is truly a unique feeling to stand in a spot believed to be the very place where a young Jesus studied and prayed and later declared himself to the The Messiah. As a Jew, I was enveloped by a sense of awe. Awe of the power of one man to change history. Awe of the forces that operate on us beyond our capacity to comprehend. Awe of the fact that a small space of peace can be found within a turbulent and violent world. And then to turn and see the beautiful tiny courtyard, knowing that a world bustles outside its gate, you need to prepare yourself to rejoin that bustle. The market awaits me beyond the gate and I'm not in a hurry to re-enter it. But I must. Have you been to the Synagogue Church? Would you like to visit it? It is so wonderful to have come across a writer like you Sheri. You take me places that I know it's not likely I will ever have the opportunity to visit or see. Having read this article, I feel like I just traveled to Nazareth. I'm awe struck! Thank you so much! Will get back to writing about these places when I can. Thanks for the encouragement. I really enjoyed this article, Sheri. Sounds like a very peaceful spot. Please do write about more sites, as some of us may never have the opportunity to visit even though we may love to. @BrendaReeves - thanks so much for your kind comments. @LPerry - hope you get here as well. It IS an amazing country and I hope to write more articles on different sites with time. Fascinating read! I hope to visit Israel someday; it is an amazing country. I love these photos. Thank you for including them in this interesting article.